As schools and districts shift to online learning resources, three significant barriers prevent the effective use of digital curriculum; the management of login credentials, provisioning of class rosters and grade results reporting. Managing Login Credentials - Currently, teachers and students must interact with many different district-provided digital resources. More often than not, a unique username and password are required to gain access to the content. Keeping track of multiple user accounts is very time consuming and can be very frustrating for both teachers and student. Managing Class Rosters - It is also common practice for a district to extract custom CSV files from the district’s Student Information System (SIS) or other system and upload them individually into a myriad of online tools, content, and platforms in order to pre‐provision user access to digital resources. Districts can no longer continue to generate proprietary file formats for students to access digital curriculum as this requires too much time and effort. Managing Class Grade Results - Reporting grades from an LMS to the student system of record is time-consuming and error-prone. Why does this information need to captured in multiple systems? Well now, thanks to IMS interoperability solutions, it doesn’t. 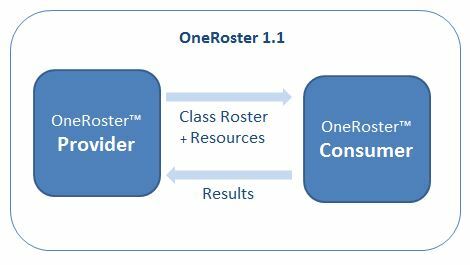 To solve the class rostering and grade reporting challenges, IMS and its members developed the OneRoster version 1.1 standard. K-12 districts identified the need for a single, unified format for exchanging roster information, leading to a significant improvement for teacher and student access and greatly reducing the impact on IT resources. Integrations with district and third-party systems put a strain on IT resources and often require custom API development and integration. The manual effort of daily and weekly updates of student information and start-of-school workloads are time-consuming and costly. OneRoster provides a standard way for school districts to securely publish class roster information and exchange grades between certified platforms. As a set of defined services and operations, OneRoster eliminates the need for custom integration work; allowing updates to be automated and the provisioning of new systems into the district’s ecosystem to be done within minutes, not days or even longer. In addition to OneRoster, IMS Global Learning Consortium developed Learning Tools Interoperability® (LTI®) to address the login credential problem, establishing a standard way of integrating rich learning applications (installed locally or in “the cloud” and often provided through third-party services) with platforms like learning management systems, portals, or other educational environments, while allowing single sign-on to these tools. Thus, students and teachers are required to remember only one password—significantly reducing the barriers and frustrations of gaining access to digital resources. For more information about LTI, read the LearningTools Interoperability RFP Guidance and Checklist. The recommended version of the standard is OneRoster 1.1 which gives the ability to exchange class resources and to separately receive grades in return. OneRoster Resources and OneRoster Gradebook Results are separately certified features. Two Methods of Exchange - OneRoster provides a powerful services model with two methods of data exchange, designed to meet the needs of each district. The CSV exchange uses the common spreadsheet-form file export and import in a consistent and easy-to-adopt form for legacy systems. The REST API method is a modern web-service that directly connects the provider and consumer, eliminating the need to run a separate import-export. IMS provides Conformance Certification for its specifications. That means that IMS will guarantee certified products will interoperate as described in the specification. Should an issue arise, IMS staff work directly with the product supplier to identify and correct the issues. The District is requesting IMS certified support for OneRoster version 1.1. Do you provide certified support for OneRoster Resources? Do you provide support for OneRoster Gradebook Results? What is your IMS OneRoster conformance Certification Number? If you are publishing data will you be providing Demographics data? Do you support the import and/or export of CSV data?